With exciting research on nutrient content, a new grading system, and modern sanitary production methods, maple syrup with all its richness isn't just for breakfast anymore. Despite its popularity, maple syrup can grow only in a very small region of the world. "Maple syrup can only be produced in eastern North America," says Ray Bonenberg, a maple producer and president of the International Maple Syrup Institute. "Sugar maple trees can grow elsewhere in the world, but maple syrup can only be made in areas with very specific environmental conditions. You need consistent cold at night (20° to 25° F) and relative warm in the day (up to 40° or 45° F) to get the sap to run. There are only 14 or 15 states and four Canadian provinces with the right climate." Maple syrup always has been made in essentially the same way: Collect sap from maple trees (primarily the sugar maple Acer saccharum Marsh. and the red maple Acer rubrum L.) and boil it to remove the liquid and concentrate the sugars. "The boiling process concentrates the sap until it's around 66% to 68% sugar, primarily sucrose," says Navindra Seeram, PhD, a renowned maple syrup researcher at the University of Rhode Island College of Pharmacy. "The caramelization that occurs during heating creates the unique flavor, color, and odor that's characteristic of maple syrup. It takes 40 liters of sap to make one liter of syrup." While the basic process remains the same, the industry has undergone considerable change. "There have been astounding changes in maple syrup production in recent years," Bonenberg says. "Breakthroughs in equipment, techniques, and sanitation have improved efficiency, quality, and food safety in the industry." While many people still picture a tin bucket hanging from an open spout (called a spile), there were drawbacks to this method. "People like to see the old traditional methods," Bonenberg says, "but they certainly don't like lead in their syrup from the solder in the seams of that bucket, or mold getting in from open or unsanitary conditions." More common now are vacuum-sealed tubes connected to the spiles, which transport sap directly to lead-free stainless steel tanks. "Instead of oil- or wood-fired evaporators to boil off excess water, producers can now use more environmentally friendly reverse osmosis machines to excrete water before boiling," Bonenberg says. "This cuts energy consumption, time, and money, and studies show it does not impact taste or nutrients." There are other benefits to a closed system of tubes as well. "The closed system lengthens the sugaring season," Bonenberg says. "When you tap a hole in a tree, the warm daytime air triggers the tree to heal, and the hole begins to close. A vacuum-sealed tube on the end of the tap prevents air from entering, so the hole stays open longer, extending the sap-collecting season from about four weeks to six weeks, or even up to three months." Packing and conditions in the "sugar houses" where the sap is boiled also have changed. "The industry strongly encourages sanitary production practices and sterile storage of empty bottles to cut down on airborne contaminants, and hot packing (reheating in the bottle up to at least 180° F)," Bonenberg says. "There are 22 different species of mold and yeast that can grow in sugar. Although none of these are toxic, no one wants to find mold growing in their food." Even the way syrup is classified and labeled has recently changed. Canada's maple syrup classifications differed from those recommended by the USDA, and several states had their own nomenclature. Syrup labeled "US Grade A Light Amber" in one place might be called "Fancy" in Vermont, or "No. 1 Extra Light" in Canada. Moreover, the USDA regulations called lighter syrup Grade A and darker syrup Grade B. While this designation referred only to color, American consumers, accustomed to grade signifying quality, may have assumed Grade B syrups were of lesser quality. Pure maple syrup is all natural, as it contains no additives and doesn't undergo a refining process that removes nutrients. It's simply concentrated tree sap. "Sap can be considered the lifeblood of the tree," Seeram says. "It moves nutrients from the soil to the new buds, which will become leaves. It has vitamins, minerals, amino acids, organic acids, phytohormones, and phytonutrients. The boiling process removes water, which concentrates the sucrose and also the micro- and phytonutrients." A quarter cup of maple syrup has about 217 kcal and provides 95% DV of manganese and 37% DV riboflavin (based on a 2,000-kcal diet), as well as zinc, magnesium, calcium, and potassium.4 Seeram and his colleagues have isolated 67 different phytochemicals from maple syrup, mostly phenolics (lignans and phenylpropanoids) with antioxidant properties.5,6 Using laboratory assays, the researchers found the antioxidant capacity of the compounds extracted from maple syrup to be comparable to that of vitamin C and a synthetic commercial antioxidant.5,6 One nonphenolic phytochemical, a sesquiterpene called phaseic acid, is an oxidative metabolite of a plant hormone (abscisic acid) that's been studied for its potential efficacy in the treatment of diabetes and inflammation. Seeram and his colleagues also have found that maple polyphenols can arrest colon and breast cancer cell growth in laboratory-based studies, and they recently received a USDA grant to explore the anti-inflammatory properties of maple syrup phytochemicals in an animal model of metabolic syndrome.7,8 Despite these promising avenues of research, Seeram recommends that consumers drizzle, don't guzzle. "While one should never overconsume any sugar, maple syrup contains compounds that may have beneficial effects," he says. "I don't suggest reaching for maple syrup to get antioxidants, but if you choose this sweetener over others, you will get small amounts of antioxidants." Several of the compounds isolated by Seeram's group were newly identified compounds, one of which is getting particular attention. "In our analysis of maple syrup, we discovered a new compound we named quebecol in honor of the province of Quebec in Canada, which leads the world's production of maple syrup," he says. "Quebecol is formed during the intensive heating, when the polyphenols in the sap react amongst themselves. It has striking structural similarities to the anticancer drug tamoxifen." While quantities in syrup are very low, the compound has been chemically synthesized by Seeram's group and other scientists, and potential pharmaceutical uses for this maple syrup compound are being explored. "There are currently no human clinical trials that support health benefits of maple syrup," Seeram continues, "but a handful of animal studies published in Canada, Japan, and the United States support the potential health benefits of maple syrup when compared to sucrose solution alone." Although maple syrup has more nutrients and phytochemicals than refined sweeteners, it's still about 65% sugar (fructose, glucose, and sucrose in varying amounts depending on color and natural variations).9 "The 2015–2020 Dietary Guidelines for Americans (DGA) recommend added sugars make up no more than 10% of daily calories," says Isabel Maples, MEd, RDN, a spokesperson for the Academy of Nutrition and Dietetics. For an average 2,000-kcal diet, that's 50 g sugar, roughly the amount found in 1/4 cup of maple syrup.4 "The American Heart Association goes even lower," Maples says, "recommending no more than six teaspoons of added sugars a day for women and children, and nine for men." Restrictions on added sugars (but not those found naturally in foods like fruit and dairy) are designed not only to ensure an adequate intake of nutrient-rich foods within calorie limits but also to support overall health. 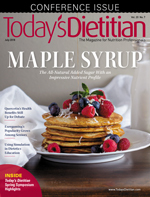 "According to the DGA, evidence on added sugars and health outcomes is still developing," Maples says, "but there's strong evidence that dietary patterns with lower sugar intake are associated with lower CVD risk, and moderate evidence that these patterns are associated with lower risk of obesity, type 2 diabetes, and some cancers." Seeram agrees that all sugars should be consumed in moderation, but recommends swapping out less nutritious sweeteners for maple syrup. "Maple syrup is first and foremost a sweetener," Seeram says, "so, when choosing a sweetener, why not select one that has micro- and phytonutrients instead of refined sugar or high-fructose corn syrup, which do not have these nutrients?" When using maple syrup in a recipe in place of another sweetener, some adaptations are required (see sidebar). In addition to its nutrient and phytochemical content, maple syrup meets the requirements of consumers concerned about the environmental impact of their foods. "This is a natural, sustainable product," Seeram says, "and for people in eastern North America, it's also a local product." This may be part of the reason why maple syrup's popularity is increasing. "Culinary demands for maple syrup are increasing and expanding as chefs and food processors look for more natural sweetening options," Bonenberg says. "There's a stereotype that maple is for breakfast, but it's now moving into things like glazes, salad dressings, and baked goods." Maples suggests pairing it with fall foods like butternut squash, acorn squash, and apples. "It also works well in oatmeal, on top of ice cream, as a poultry rub, and instead of molasses in barbecue sauce," Maples says. "And putting a little maple syrup in oatmeal or plain yogurt may increase the palatability of these nutrient-rich foods." As a sweetener, maple syrup offers a unique flavor and nutrient profile not found in other options. "Maple syrup meets the growing demand for quality natural ingredients to brighten up your plate and give your food a 'wow factor,'" Bonenberg says. "Sure, it's sugar, but it's a better sugar." 2. Wills K. Celebrating the history of maple syrup. Michigan State University Extension website. http://msue.anr.msu.edu/news/celebrating_the_history_of_maple_syrup. Published March 20, 2017. 3. US Department of Agriculture. United States standards for grades of maple syrup. https://www.ams.usda.gov/sites/default/files/media/MapleSyrupStandards.pdf. Published March 2, 2015. 4. Basic report: 19353, syrups, maple. US Department of Agriculture, Agricultural Research Service website. https://ndb.nal.usda.gov/ndb/foods/show/19353?fgcd=&manu=&format=&count=&max=25&offset=&sort=default&order=asc&qlookup=syrup+maple&ds=SR&qt=&qp=&qa=&qn=&q=&ing=. Updated April 2018. 5. Li L, Seeram NP. Maple syrup phytochemicals include lignans, coumarins, a stilbene, and other previously unreported antioxidant phenolic compounds. J Agric Food Chem. 2010;58(22):11673-11679. 6. Li L, Seeram NP. Further investigation into maple syrup yields 3 new lignans, a new phenylpropanoid, and 26 other phytochemicals. J Agric Food Chem. 2011;59(14):7708-7716. 7. González-Sarrías A, Ma H, Edmonds ME, Seeram NP. Maple polyphenols, ginnalins A-C, induce S- and G2/M-cell cycle arrest in colon and breast cancer cells mediated by decreasing cyclins A and D1 levels. Food Chem. 2013;136(2):636-642. 8. URI faculty secure $470,000 in USDA funding for maple syrup research. The University of Rhode Island website. https://today.uri.edu/news/uri-faculty-secure-470000-in-usda-funding-for-maple-syrup-research/. Published February 13, 2018. 9. van den Berg A, Perkins T, Isselhardt M; University of Vermont. Sugar profiles of maple syrup grades. https://www.uvm.edu/~pmrc/sugarprof.pdf. Published 2006. Substitute 3/4 cup maple syrup for each cup of sugar. Reduce other liquids by 3 T.
Add 1/4 tsp baking soda to the dry ingredients unless the recipe includes acidic ingredients like yogurt, sour cream, buttermilk, or lemon juice. Reduce oven temperatures by 25° F to avoid burning or overbrowning when using maple syrup in place of sugar in toppings, glazes, or basting liquids. Maple syrup caramelizes faster than white sugar. Use Dark or Very Dark syrups for cooking if available, as the flavor becomes milder with baking. When using maple syrup in place of honey, molasses, or corn syrup, keep the quantity the same. The end result will be a little bit less sweet. 2. Cut the top rind off of the Brie round. 3. In a small bowl, mix syrup, cranberries, and walnuts together and spoon on top of Brie. 4. Place on a foil-lined baking sheet or ceramic Brie baker and bake for 15 to 20 minutes, until soft. — Source: Adapted from the Ontario Maple Syrup Producers Association, OntarioMaple.com, and Lynn Ogryzlo. Photo courtesy of the Ontario Maple Syrup Producers Association. 2. Combine syrup, mustard, oil, and pepper and spread mixture over pork on all sides. 3. Place pork in a shallow pan lined with foil. Roast for about 20 to 25 minutes or until internal temperature reaches 155° F, measured using a meat thermometer. — Source: Adapted from the Ontario Maple Syrup Producers Association, OntarioMaple.com. Photo courtesy of the Ontario Maple Syrup Producers Association.